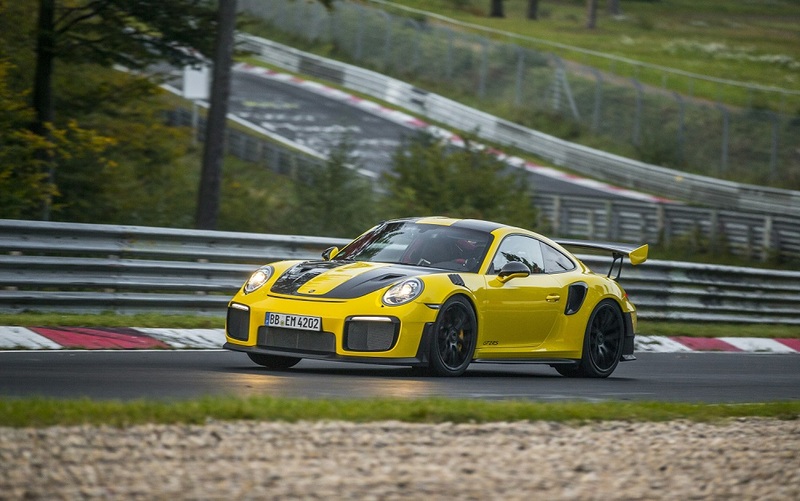 Porsche set a new lap record for street legal sports cars on the 12.8 mile (20.6 kilometer) Nürburgring-Nordschleife with the 2018 911 GT2 RS. Recorded and officially timed on September 20, the best lap time of 6:47.3 minutes even surpassed internal expectations. Frank-Steffen Walliser, Head of Motorsport and GT Cars for Porsche AG, said: "At the start of the development process, we set ourselves a lap time target for the GT2 RS of less than 7 minutes and 5 seconds. The credit for beating this target by 17.7 seconds goes to our development engineers, mechanics and drivers, who demonstrated an exceptionally strong team performance. This result makes it official: The GT2 RS is not only the most powerful, but also the fastest 911 model ever built." The record lap was not just a single occurrence: Lars Kern of Germany and Nick Tandy from Great Britain broke the previous record for street legal sports cars (6:52.01 minutes) immediately and proceeded to lap the track in under 6:50 minutes on five separate laps. Andreas Preuninger, Director of the GT model line, stated: "It's not just the record time achieved by the GT2 RS that demonstrates the vehicle's caliber, but also the consistency of performance in every lap. We're particularly proud of the fact that this was achieved with two different vehicles and two different drivers, as it underscores the ability of the GT2 RS to reproduce the record over and over again." Porsche factory driver Nick Tandy traveled directly from the six hour race in Austin, Texas to the Ring and adapted from driving the Le Mans prototype Porsche 919 Hybrid to the 700 hp 911 GT2 RS fitted with standard N-spec Michelin Pilot Sport Cup 2 tires in impressive fashion. Lars Kern, Porsche test driver by trade and a passionate race car driver in his own right, was the one to set the fastest final time. In addition to the Carrera Cup Australia, Kern regularly competes in the German VLN endurance racing championship on the Nürburgring and knows the Nordschleife like the back of his hand. The ultimate record lap began under ideal track conditions at 7:11 p.m. local time and ended 6:47.3 minutes later. The average speed on the 12.8 mile (20.6 kilometer) lap was 114.4 miles per hour. The fastest and most powerful road-going 911 celebrated its world premiere at the Festival of Speed in Goodwood, Great Britain. The heart of the high-performance sports car is a twin turbo flat-six engine producing 700 hop. This enables the two-seater weighing 3,241 pounds to accelerate from 0 to 60 miles per hour in 2.7 seconds. The top track speed of the rear-wheel drive Coupé is 211 miles per hour. Thanks to the race-bred powertrain, the new 911 GT2 RS surpasses its predecessor, which was equipped with a 3.6 liter engine, by 80 horsepower and delivers up to 553 lb.-ft. of torque.